This is the 32nd year for the Run for the Apples. What started in 1986 with a group of about 60 runners has turned into one of the Twin Cities favorite runs and walk. Apple treats available to all participants after the run. The location – Pine Tree Orchard is located in White Bear Lake, Minnesota just northeast of the Twin Cities. Hundreds of individuals and families from the area make trips to Pine Tree Orchard a family tradition. Join them this year! During the fall Pine Tree offers weekend entertainment, pony rides, wagon rides, and a corn maze; pick your own pumpkins, a large variety of apples, homemade bakery products, caramel apples, fresh cider, gifts and more! Pine Tree’s bakery is famous throughout the area for creating a variety of special apple and strawberry treats. Their pies have received rave reviews for many years because of their homemade taste. Whether it’s a traditional or seasonal favorite there is something just for you. The Jacobson family from the Pine Tree Apple Orchard are always outstanding host. The is a link to a map to the orchard on the website but it is easy to find. Take Hwy 96 east from White Bear, turn left on Apple Orchard Road, follow to Pine Tree Apple Orchard. After the race, you can stick around for hayrides, trips to the corn maze and pumpkin patch and everyday Pine Tree fun. Don’t forget to bring an apple pie and some donuts home. 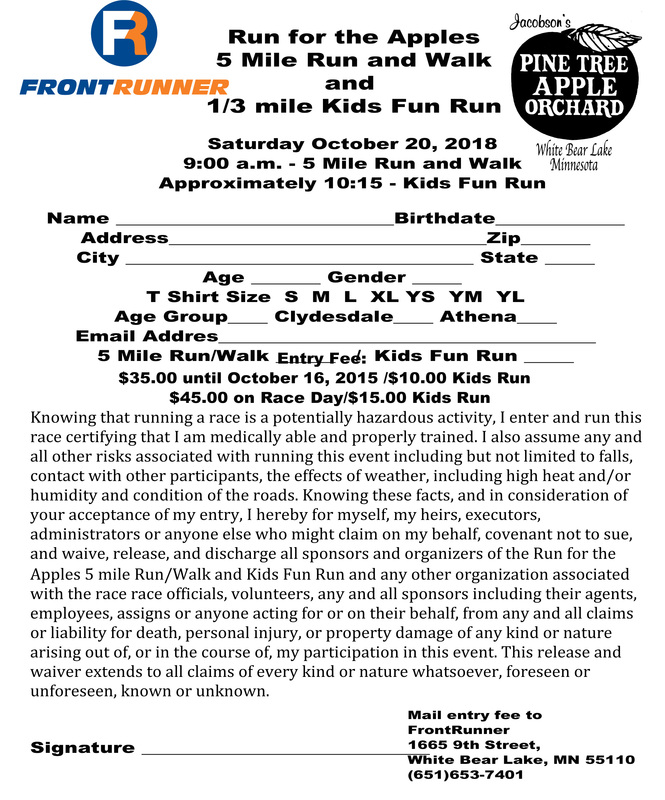 The course – This beautiful course is on the trails through the apple orchard, strawberry fields and pumpkin patch. The footing varies from gravel to pavement. You will compete with some of the best runners in the midwest or you can just enjoy walking through the scenic countryside. Long Sleeve t shirts to all 5 Mile finishers, All Kids Fun Run participants receive a short sleeve shirt and a finisher’s medal. Online Registration Closes at Midnight Thursday October 18. There will be race day registration. Paper registration will continue through race day. No registrations will be taken over the phone. Cash and check are accepted on race day. Friday, October 19 – Pick up your packet a day early at: FrontRunner, 1665 9th Street, White Bear Lake – Noon until 3:00 p.m. Please wear your bib number on the front of your shirt/jacket. It will contain your timing chip.